For the first time since 2003, a Weston indoor track team didn't win the SWC title. Going into this year, Weston's boys won six SWC titles in eight years, and the Lady Trojans won six straight titles.. Weston left the Floyd Little Athletic Center in New Haven title-less Saturday because Newtown and Immmaculate dethroned the Weston boys and girls, respectively. The Trojans took second with 64 points in the 13-team field behind new-champion Newtown (93). The Lady Trojans (71.25) took third, falling short to Immaculate (87) and Newtown (81). No one can fault junior captain David Stankiewicz for the Trojans falling short. Stankiewicz won the 1,000 meters with a time of 2:39.05 despite missing a week of practice because of a stress fractured tibia in his right ankle. "I'm pretty happy I won," Stankiewicz said. "I was thinking about my team when I ran, and I did it for my team." Weston took second in the 4x400-meter relay (3:36.34), which Stankiewicz anchored. Senior Jensen Frost, junior Jon Savicky and freshman Simeon Okoro ran the first three legs of the relay, which was won by Oxford (3:34.40). "We were right behind them going into the corner and I tripped," Stankiewicz said. "Not sure if we would have won but it would have been closer [if I didn't trip]." Junior Larry Cass won the shot put (43-4.5) for the Trojans. One Weston athlete who came close to the winner's circle was junior captain Noah Krassin. Krassin anchored the 4x800 meter relay team (8:42.13) and the sprint medley relay (SMR) team (3:56.47) to second place finishes. Senior Jack Curran, junior Matt Bolin and freshman Cole Clark ran the first three legs of the 4x800, and Okoro, sophomore Bryan Lonergan and Savicky ran the first three legs of the SMR. Frost was a major contributor by placing third in the 600-meters (1:26.68) and running the leadoff leg for the fourth-place 4x200-meter relay team (1:39.17). Okoro ran the second leg of the 4x200 and was followed by sophomore Greg Kaeser and the anchor Savicky. Senior captain Brad DeMarco (4:43.21) and Clark (4:43.68) were five-six in the 1,600 meters. Sophomore Nick DiBartolomeo took third in the pole vault (11-0) and Kaeser was sixth in the 55-meter hurdles (8.67). "I was happy with how it turned out and we had good performances," Stankiewicz said. "We were seeded third and moved up to second." 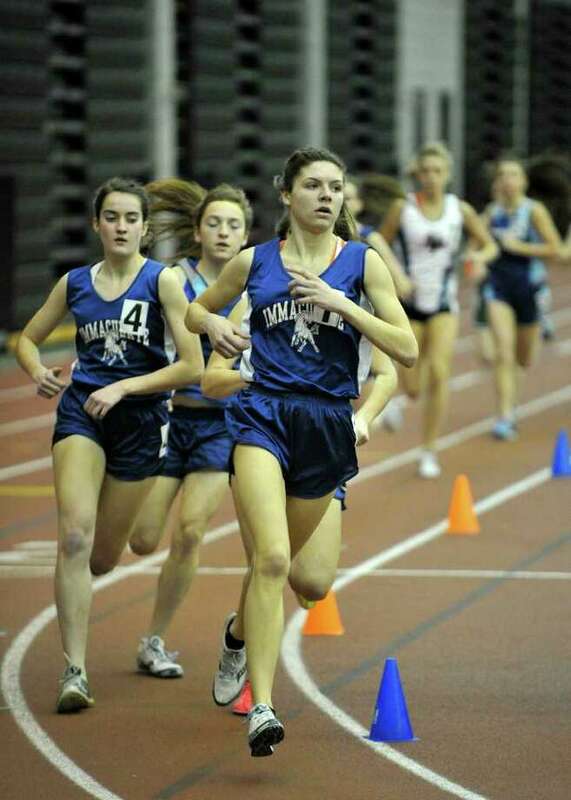 Junior Emily Savage had a career-meet and gave the Weston girls a chance to win. "I felt I did really well, but didn't expect to go far and high in my events," Savage said. "I'm happy we had a lot of people qualify for states. I was hoping to continue the Weston tradition. We fell short, but still did well." Savage won the high jump (4-10) and long jump (17-2), and took second in the pole vault (11-0). It was only the second time she ever did the long jump. "I was thinking about winging it in the long jump to see how far I can go," Savage said. "For the pole vault, I was hoping to clear 11-0, and for the high jump, I was hoping to clear 4-10." Senior captain Tess Fagan (4-8) and sophomore Chloe Shapiro (4-6) took second and sixth, respectively, in the high jump. Sophomore Stephanie Thomson, junior Andrea Janis and Fagan finished in a four-way tie for fourth in the pole vault (7-6) with New Fairfield's Karen McKeon. Relays were a strong point for the Lady Trojans. Junior Sydney Allon, sophomore Whitney Farber, senior captain Hannah Goodman and junior Amanda Matluck carried the 4x200 (1:51.22) to second place. Allon, Farber, Goodman and senior Nina Low brought the 4x400 (4:13.86) to third place and Allon, Goodman, Matluck and sophomore Michaela Dyson got the SMR (4:40.16) to third place. The 4x800 (10:48.57) finished sixth with junior Stephanie Buffa and sophomores Caitlin Coates, Helena Low and Jordan Isaacs. Also scoring for Weston were Farber in the 300-meter dash (42.85), who placed fourth, and senior Kaylie Bucaro in the shot put (27-4), Nina Low in the 600 meters (1:48.11), who both finished fifth. One thing that may have made a difference for the Lady Trojans was injuries. They were missing junior Sara Dietzman, who started to come into her own as a dominant sprinter last spring in outdoor track, and sophomore Jane Wall, a pole vaulter and sprinter. "We would have scored more points, but Immaculate and Newtown have done well all year," Savage said. "It would have been closer." Next up for the boys and girls teams are the Class M championships tomorrow at 4:30 p.m. at the Floyd Little Athletic Center. "I hope to get 11-0 again in the pole vault and it would be amazing to do 5-0 in the high jump," Savage said. "I hope to do 17-0 again in the long jump."